The declassified tale of the first U.S. soldiers who land in Afghanistan in the days after 9/11 is the focus of 12 Strong, but sadly, the creators spend too little time on these men, their personalities and the audience doesn’t connect well. The result is a weak war film with that Jerry Bruckheimer feel. 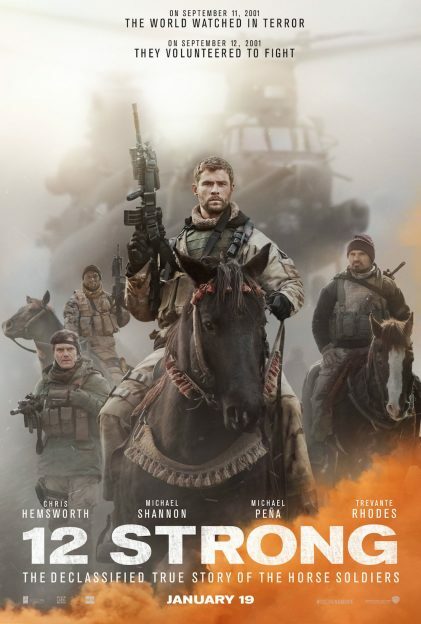 Chris Hemsworth stars an inexperienced leader of ODA 595, an elite Special Forces unit that was ordered to link up with a local warlord (Navid Negahban) and fight its way, village by village, to the Taliban stronghold of Mazar-i-Sharif to destabilize the Taliban network. Hemsworth has commanding moments which are complimented by Shannon and Pena, but they are surrounded by faceless grunts and this is shame. Hemsworth seems miscast, offering up a pathetic American accent in some scenes, but abandoning it in others. 12 Strong is director Nicolai Fuglsig’s first feature so it’s unfair to be too tough on the filmmaker for the lack of Saving Private Ryan inspired character development, but that’s what this film needed. The film does that, but little else. 12 Strong chronicles the victory by the men of Task Force Dagger, important in a moment, but lost in the chaos of history and the film never brings forth any substance which changes that perception. 12 Strong is also doomed by the shadow of far superior projects, American Sniper or The Hurt Locker, or those with more powerful stories, i.e. Lone Survivor or Zero Dark Thirty.